The great people from Kuznia Gier gave us a review copy of Alcatraz: The Scapegoat. Thanks a lot! Jonny “The Polish” Mlynarski looked around for his companions’ signal. Not yet. Not yet. Now all their hands were raised in a nonchalant gesture, the signal that all the guards were otherwise occupied. He quickly slipped behind the shed that stored what little sports equipment they could use in the prison yard, opened the manhole there and slipped back out. His humming while he walked away told the others his task was completed. The open manhole would be discovered in slightly less than two hours when the guards completed their round of the yard, but if everything went to plan, it wouldn’t matter than. If everything didn’t go to plan, it likely wouldn’t matter either. Welcome to Alacatraz. The Rock. The most famous prison in the world. Officially, no one has ever escaped from the island in San Francisco Bay, although many have tried. And in the long line of failed attempts, you are about to add another one. As a group of three or – better – four inmates who all have a very good reason to rather be outside the walls, you devised a plan. The plan is ingenious, a masterpiece or cunning and guile with a bit of violence mixed in for good measure. The plan does, however, have a downside: it hinges on one person staying behind, and the list of volunteers is unsurprisingly short. 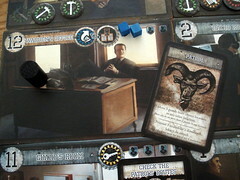 Alcatraz: The Scapegoat shares many basics with a long line of cooperative games: in every round the game makes its move first and randomly adds a guard to one of the twelve locations. Then the players all take their actions trying to execute the escape plan. 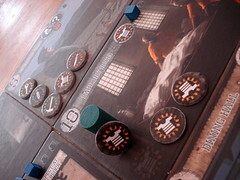 With their two (or three, in three players) actions they can move through the prison’s locations, start riots to control where the guards go and use their current location’s special action. Many of the location actions let you pick up items that you need to complete parts of the plan. Some others grant you other advantages, but since we want to escape from Alcatraz, the items are what is interesting for now. Another action you can and will take on your turn is, obviously, to complete an element of your daring escape plan. There are always three random elements spread around the prison, each with its own tool requirements and a letter A to F. Which specific elements you complete is not really important, you just need all six letters between yourself and your accomplices to be able to escape. To speed things up, when you complete an element and take the letter from there your associates gain a random letter. All of them, that is, except for the scapegoat. Bugsy Malone was not happy. He rarely was, but right now, he was even less happy than usual. Some of his so-called companions had ratted him out to the wardens as the one who stole a pile of meat knives from the kitchen. The knives were absolutely necessary for the plan, but it was even more important to have a scapegoat when the missing knives were discovered, to prevent the guards from searching all the cells for them. Bugsy understood the necessity, but he disagreed on who was chosen to go to the isolation cell for three days. Bugsy was furious, and someone would feel his fury soon. The scapegoat is the one guy that is left out – there’s no real explanation given why there is always exactly one guy left behind, but that’s not the big point, anyway. The big point is that the scapegoat makes the game tense in two ways. On the one one hand, you don’t want to be him – the scapegoat can’t complete any elements of the plan. Neither does he get the random element when someone else does. And when you don’t have those elements, your friends – the word does sound ironic here – may just decide they don’t need you. On the other hand, you don’t want anyone else to be the scapegoat either as the scapegoat gets some special abilities. He has additional actions on his turn, more of them the longer he remains in that role, and he can use the powerful blackmail cards. The blackmail cards are picked up from the wardens office, and more often then not you don’t actually use them – their real value is in using them as the name implies: to convince the other players that making you the scapegoat is not in your best interest because you could use it. Now, what is all this talk about making someone the scapegoat about? We had cooperative games with a traitor before, you get your loyalty card at the start of the game and then start messing up peoples’ plans. 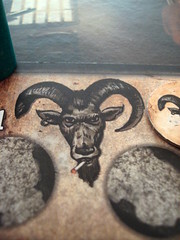 Alcatraz: The Scapegoat doesn’t have a traitor mechanic in that sense. Your loyalty is never in question, you all want to escape after all. The scapegoat doesn’t try to prevent that, he just wants the progress to happen when he is not the scapegoat any more – because the scapegoat can change every round. After the new guard is placed, but before players take their actions, the discussion and the vote on who will be this round’s scapegoat happen. A lot of factors go into this vote: who is carrying items that can complete an element of the plan this round? He shouldn’t be the scapegoat, he can do something useful instead. Who has blackmail cards to play? We’d rather not make them angry. The dude that was the scapegoat last round? He would have 4 actions now, maybe he even has stamina for a fifth action. He could really ruin our plans.I’d advice you use a timer and enforce the two minute limit on the discussion that the rules set, otherwise you’ll be playing for a long time. If you look at it the other way round, you will work hard not to be the scapegoat. Either make yourself useful, or make yourself threatening. And that’s where any similarities to cooperative games disappear. Sure, you cooperate to escape from Alcatraz, but more than anything you want to be on the raft when it leaves – or the boat, or maybe the home-made helicopter. You cooperate by necessity, but your number one priority is yourself. With everyone watching out for number one, the game would go on forever. But the new guards entering the game every round create a tight time limit. When they are all there, the game ends and nobody wins. and even before that, having too many guards present in one room makes it hard or even impossible to work on your escape plan there. The longer you take, the harder everything becomes. So you have to find the balance between your own advantage and managing to escape. The other way to end the game is to complete all the necessary elements of the plan, with one player to leave behind. The scapegoat is at a disadvantage again, he’ll be left behind if possible. Just as often, the scapegoat will be the only one to have one element of the plan and will have to be taken along while some other unfortunate prisoner watches the boat leave. Thus collecting the right elements becomes another important decision in Alcatraz. As long as you’re the only B around, your spot on the boat is safe. Maybe you even want to be the scapegoat so you can prevent the other players from completing another B card. But that’s where an annoying element of luck enters the game: you can play well for the whole game, protect one of your precious elements from being completed by anyone else and still stay behind in the end because another player got the element that was uniquely yours as a random draw. As you all know, I’m not against luck in my games, but this specific scenario is frustrating. This piece of luck in Alcatraz: The Scapegoat is even worse because it’s one thing that really annoys me in a game I otherwise enjoy. The concept of forced cooperation has never been implemented this well in a boardgame, you get the feeling of being dependent on the other players to escape, but you hold back from doing everything for the team so they won’t be able to leave without you. The Alcatraz setting is like it’s made for these mechanics, I can’t think of a better scenario to use them. 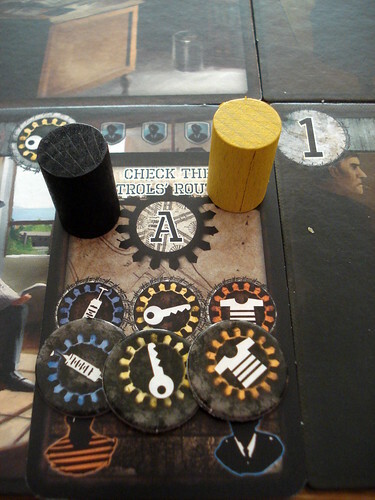 The variable game board with slightly different actions on the front and back side give this game a very high replayability, and to top everything of the game also looks good. Even with the “luck” caveat, I greatly enjoy playing Alcatraz, but there is two kinds of players that you will want to avoid even more than usual. There’s the ones that need to discuss everything to death in cooperative games. The cooperative element is there, and making plans for the round is something you need to do, but you can’t plan for the next turn because you don’t know who the scapegoat will be and what he’ll do. And some people may just not want to stick to the great plan that benefits everyone – there may be an option that benefits them more personally, and Alcatraz is really not the right place to be upset about that. Even worse, however, are sore losers. If you know any people that get upset about not winning a game, keep them away from Alcatraz by all means. The only thing that is worse than not winning a game is being the only person not to win a game. With players that don’t fall in either category, Alcatraz is a very good game that creates a completely new experience on the cooperative/competitive axis. I’m almost certain we will see more “forced cooperation” games pop up next year as game designers start exploring this new genre, but Alcatraz is the original. And if you think that escape plan is far-fetched, just go read about the only one that may have worked. Panic in Meeple City. Giant monsters are converging on the city, and it doesn’t look like anyone is going to stop them. Within minutes they start throwing cars, tearing down buildings and … MUNCHING MEEPLES! Will there be a happy ending for anyone? Times were hard during the prohibition, and you couldn’t even take a drink to make them easier. Except if you were the criminal element, then you had all the booze you could drink with enough left to turn a huge profit. And gambling and cigars on the side, too. Or you end up deep in debt with the other mobsters calling for your head. Ignacy Trzewiczek and Portal Games are usually known for heavy games, but with Rattle, Battle, Grab the Loot they ventured into family game territory. Here you wage sea battles by throwing a metric ton of dice into the game box and then using more or less improbable ship upgrades to fight. For family-friendliness, players don’t fight against one another but compete who can capture or sink the most non-player ships.